Its only been a week since I played this game but it feels like a year because of my surprise immersion into the fictional 1/72 card table game. I'll be honest, that was so easy and fun and so much like what I pictured for my 40mm toy soldiers that it had me poking about upstairs with tape and figures again recalculating the optimum balance between size and number of grid squares and playing with 2 1/2D 40mm terrain mock ups. It took a forced wander through past blog posts to remind me that there have been other games that had been interesting and fun and get me back on track. Luckily, the bits that about the card table/portable games that work best for me are not terribly applicable to the War of 1812 so that is safe, and it is today's topic. The American attack goes askew when the main attack stalls in the woods (where the smoke can be seen through the trees) so an impatient, unsupported attack goes in on the center left only to be hit by a wall or 6's from the British artillery, gunboat and skirmishers and forced to fall back as the British center advances. I've lost track but this is the 5th or 6th time at least that I have played Cryslers Farm using various rules. 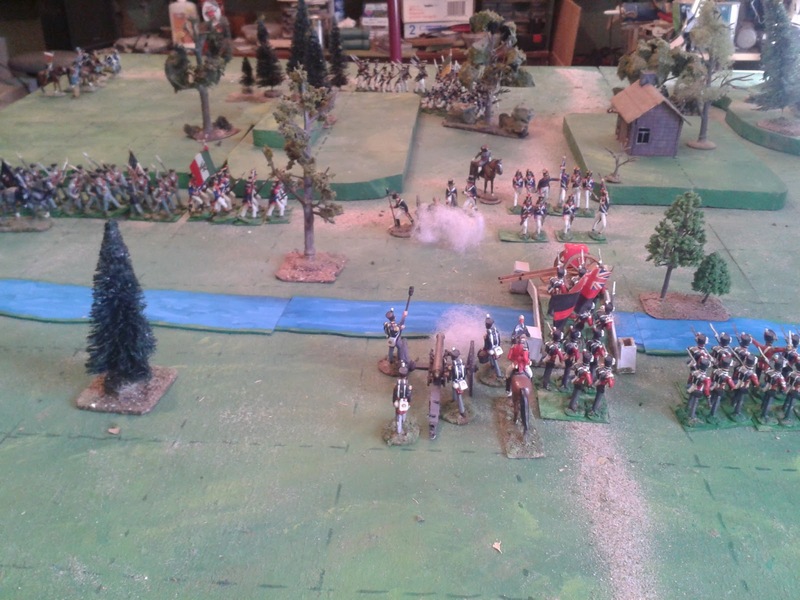 It is an interesting little action on the cusp between skirmish and battle like so many War of 1812 battles. Basically, with 2 battalions plus a few detachments totalling close to 1,000 men, the British gave a bit of a drubbing to an American force of 8 battalions plus a squadron of cavalry totalling around 2,500, give or take 500 men. The Americans fought well and the British, though well trained had a high percentage of officers and men who had not seen action before. The more I look at the battle, the more it seems to come down to generalship and command control that allowed the British and Canadians to make good use of terrain and aggressive, confident, troop handling to best the various American attacks piecemeal and so demoralized the opposing commander that he broke off the attack as fresh troops were arriving on the field. If unfamiliar with the battle the wikipedia article nicely puts it in context. November 2011 chrsylers farm game. I didn't think to look back and anyway my basing and table size has changed and the rules were an earlier version but the game OB that was used was essentially the same, give or take a stand here and there. I did give the British "General" a +1 to his orders dice and gave the American "General" a -1. He of course took this as a sign and proceded to roll as low as possible as often as possible. The American center then attacked with support by a straggler from the left. It was repulsed once but rallied and came back as the British line advanced. Once again I was happy how the rules worked in this context. The number of turns was about right, at an average of 15 minutes each, compared to the real thing and the playing time only a little less. The troops also covered appropriate amounts of ground apart from the troops in the woods who moved a little too slow. Using my usual rule of 1/4 of stands lost represent killed, wounded and missing, the casualty figures were also reasonably close. I was initially concerned that the low stand count would leave the game vulnerable to a string of good/bad luck but although thete was a string of those, one almost leading to an early destruction of the British left wing, in the end there were enough counter balances that none of the strings of luck were decisive and since both sides had them, they balanced out. 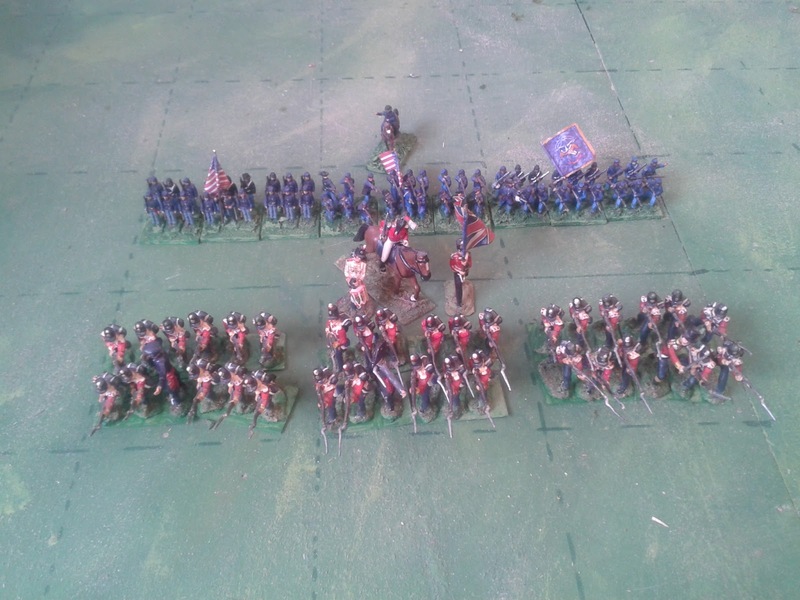 For the War of 1812 the number of infantry battalions will always be fairly low and cavalry usually limited to a single squadron so I will plan on keeping to a 1 figure = 30 to 50 men ratio giving mostly 4 stand battalions with a few 6 stand ones. Cavalry squadrons and skirmisher detachments will probably stay as 3 individuals. Three years ago I looked on Cryslers Farm as an example of the smallest viable Hearts of Tin games. Now that I have experience and acceptance of small as well as medium games, and as the rules have evolved, I see this as an average game. 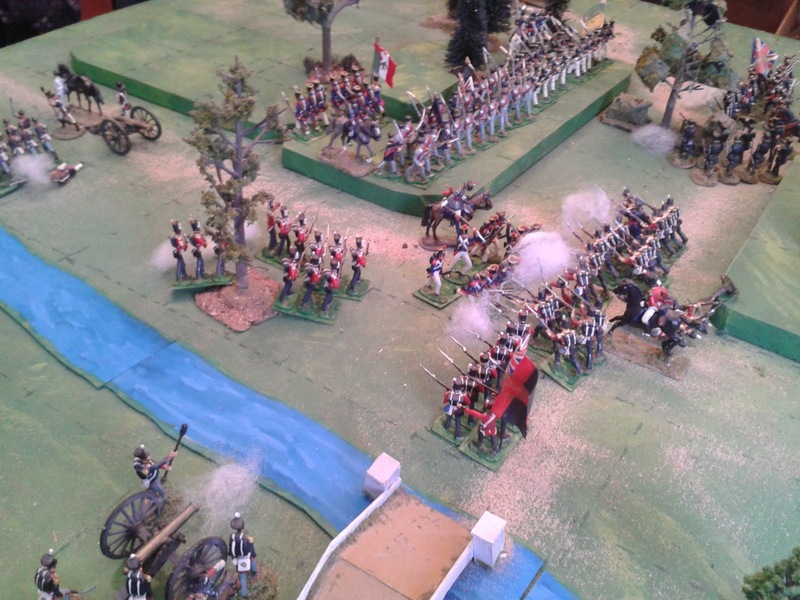 With figures based, terrain organized and a variety of small scenarios pre-prepared, I could see the War of 1812 providing both quick games, average ones and the occasional longer game. At the original proposed scale of 1:10 there would only have been medium to extra large games. This gives me a very comfortable format and rules for the War of 1812 and 1837 rebellions combined so I will press on. It doesn't require me to paint alot of new troops but there is scope for sufficient to keep me happy and the small numbers will let me do extras for occasional and what if use. I still intend to replace the 100 or so stylistically different Sash & Sabre figures (enquiries welcome) just because I can and to give me something to sculpt, cast and paint. 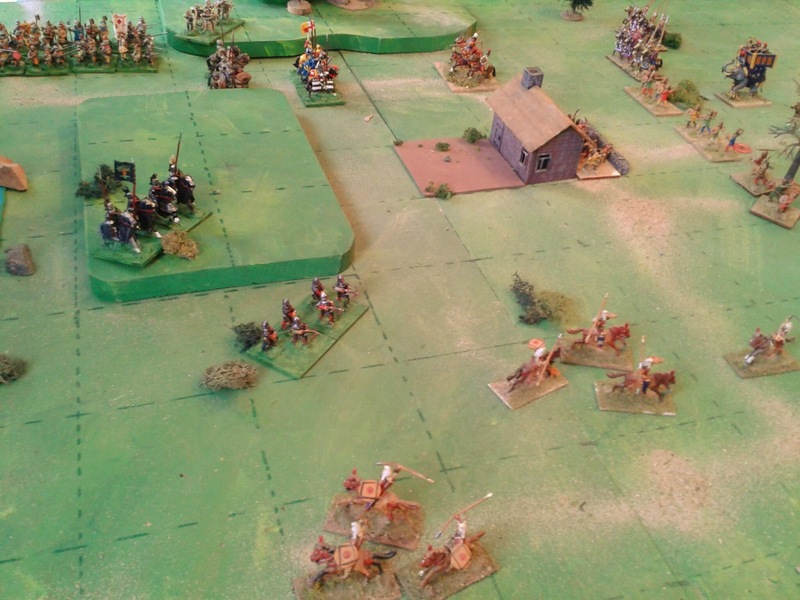 I try to cover various wargaming approaches with my collection and a workable 1812 solution fills the "refight historical battles" niche while being able to loan troops to Oberhilse and Faraway for horse and musket armies with more cavalry and easier terrain. "Happy happy" as the expression goes. 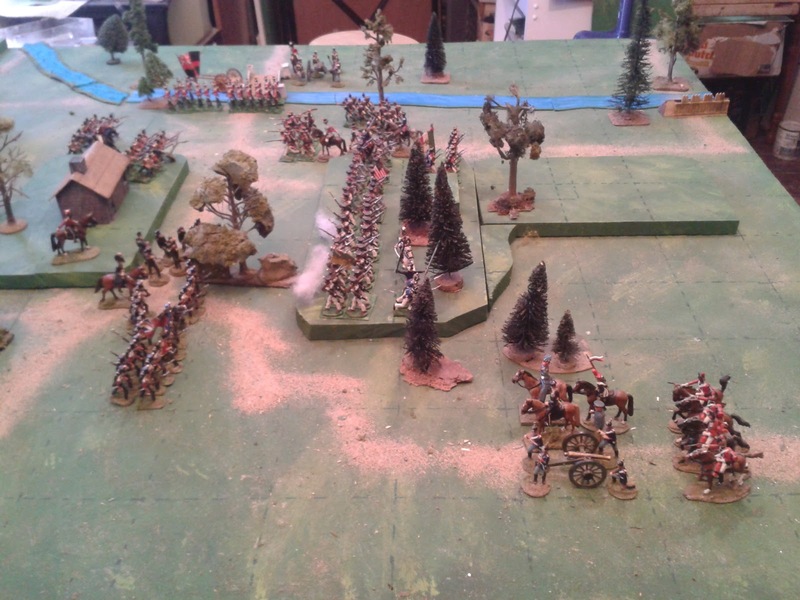 Meanwhile back in the woods the 3rd Brigade is finally in position to debouch and hit the weakened British regulars. However, I've seen enough to know that this route won't satisfy me for the later 19thC in 40mm. I'm still stuck there. Another option is to veer more towards a smaller scale "Colonial" game for the 40s, a TS&TF sort of thing (or original MacDuff). My enthusiasm is low for that though and I think I would need my bigger table back to not feel crowded and it would call for more diorama like scenery and loads of figures, more of each type than I like to think about. Lastly I have not dismissed a Rattle of Dice approach with smallish battalions of single figures. This would be similar but maybe something about it might allow that Toy Soldier feel without needing buckets of figures. Something to investigate when I get back from Huzzah in May. Too late! The American General has hit his break point. Everybody back to the boats! In the meantime the Emperor is a bit upset with this whole Free State, Republic thing and has decided to support the expedition to replace the old Duke on the throne of the Duchy of Hungover. He has dispatched an all arms force and cavalry from both allied armies are currently disembarking and should be ready for action by tomorrow. Yes, I know, I said the next post would be that Crysler's Farm report and it will come, it was a good game and deserves something, but there were ideas in my head, new troops to paint, old ones to refurbish, terrain to prepare, rules to clarify and a card table game to play. In due course, after checking for painting information in Andrew Rose's guide to Toy Soldiers as well as Kannick, Funcken and others, ransacking the cupboard for surplus painted ACW and Zulu war infantry to refurbish and looting the nascent Boer War project, I was ready to begin a late 19thC Cardtable Campaign using The Square Brigadier as rules. (Essentially a late 19thC version of the 20thC one ). The rules will appear as a blog page before long. 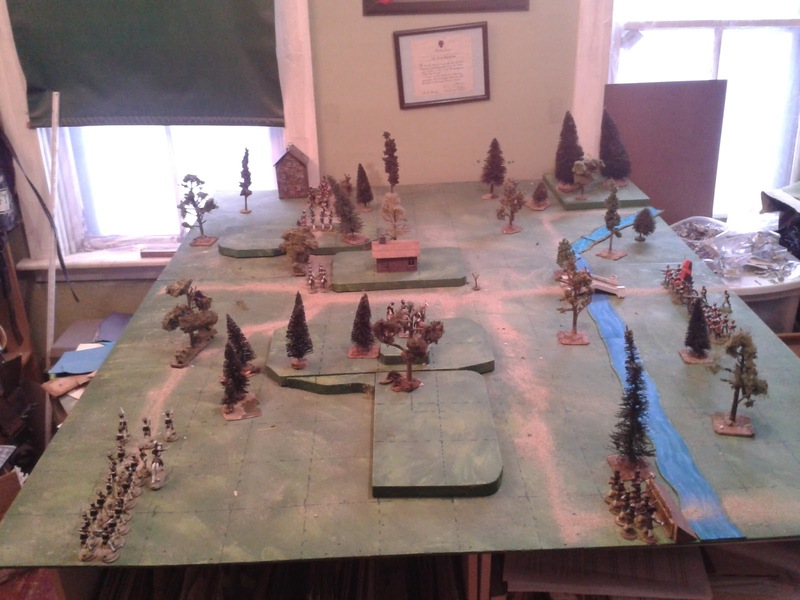 The game took somewhere between 1 and 2 hours to reach a final, surprise, conclusion and turned out to have just the sort of look and feel I have been working towards since deciding to do a permanent downstairs card table game, based on Bob Cordery's Portable Wargame with an improvised ACW version of Sawmill Village, back in November of 2012 . King Egbert, ruler of the small island Kingdom of Nottingland was, through his mother, the grandson and rightful heir of the Duke of Hungover, an even smaller Duchy on the coast of the Mainland. Unfortunately the good Hungoverian burghers got tired of paying taxes to someone who didn't work for a living and didn't conduct public policy in a way to maximize the wealth of his subjects. After a heated public debate, the Council proclaimed that the Duchy was now the Hungoverian Free State and asked the old Duke to please hand over the keys to the treasury and ducal palace and retire to his country estate. He chose instead to take a fast ship to visit his grandson. Shortly after an Nottinglish fleet appeared off the coast. The Council called the citizens of the Free State to arms and with just a roll of the drum, the Nine Years War was begun. The Hungoverians did not at the time have a standing army, apart from the City Guard, but the Customs and Internal Security departments maintained several well trained paramilitary units. There was also a strong tradition of citizen soldiers with the rural gentry and their tenants providing Mounted Rifles, the City Volunteers providing artillery as well as garrison troops and villagers everywhere being expected to turn out parties of riflemen for local defense. The armies clashed at the little town of Grant's Mills. Moving quickly, the mounted Burgers seized the town and their accurate fire forced back the MG but its return fire soon drove them from the town. The Hungoverian Infantry was slow to follow up and the Nottinglish Guards pushed forward seizing a farm on their left as well as the center of the town under the cover of their heavy artillery. The City Guard was at hand though and pressing forward through a horrendous storm of shell and bullets, took back the town in a fierce hand to hand struggle, wiping out the stubborn 1st Guards. As the Hungoverian City Volunteer artillery deployed between the town and the farm, an assault by the Nottinglish line infantry took back the town despite heavy losses. A counter attack by mounted Burgers and City Guards was wiped out but their own losses were heavy. 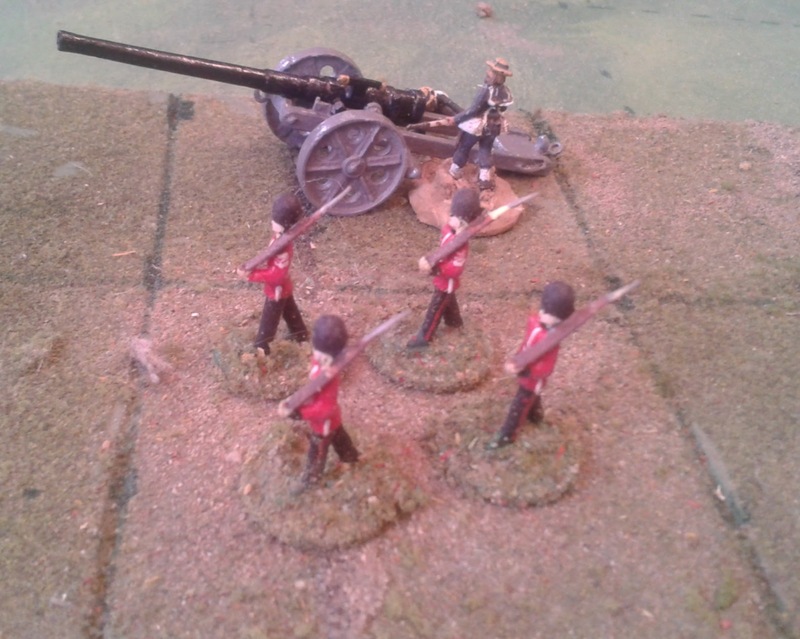 A final counter attack by the Border Police took back the town and Brigadier Steele was forced to order his last Guardsman to cover the retreat of the artillery. The battle was over but the war was just begun. Upstairs, downstairs, in my Lady's chamber. Well, maybe I won't play wargames in her chamber but the puzzle has been solved and I am on my way again to be able to play upstairs, downstairs and outside on a summer's day. A conundrum that has been befuddling me since November of 2012, how to play upstairs and downstairs and have both 40mm/1/72nd toy soldiers from the same era without duplication, has just been resolved, and in a good way. Amazing what inspiration you can find in a Junkyard and in a Hermit's closet. A quick swap and my 1/72nd forces once again include Guards, band and colour party, and Foreign Legion. Not sure when I last saw my old ones, might be more than 40 years. These ones have not been repainted or even touched up, just quickly based up Battle Cry style to see how they look on the card table gridded board. Seeing the Wargame Hermit's 15mm traditional style toy soldiers based on Peter Laing conversions got me thinking about the old Airfix Guards. Why I'm not sure since I've been planning to do 40mm ones to replace my actual old Britain's but it did and next thing you know I now have a bunch plus some Foreign Legion. I just have been unsure what to do with them. Given the few hundred ACW figures on hand, the obvious answer was to go the British involvement in the ACW route but that treads so closely on the Atlantica Red vs Blue heels that I didn't want to go there. I especially didn't want to go there since it is shaping up more as a middle school historical wargame project than as a game of toy soldiers. The Atlantica campaign as also been losing its 'playing toy soldiers' feel again despite glossy paint jobs and a fictional setting. OK, apparently I enjoy the game of toy soldier thing now and then but not quite as much in its purest form (as in firing matchsticks) nor as my main thing. So the first question to be resolved was what to do with the ACW (Airfix Conundrum Wargame)? Ditch them? Nope. Change my mind again and put Atlantica and the Warof 1812 back to single figures skirmishes? Nah, can't seem to stay there. Do the same thing with both and the heck with it? Seems counter productive. Find some way to differentiate even if using the same rules? Maybe. I started off by comparing a brigade of each. Two brigades both of 3 regiments each roughly 4" wide. 36 x 40mm figures vs 54 x 20mm ones.Yeah the little guys look a tiny bit more like a line and could fit better into realistic terrain if I were going to make it but wargame wise they are replaceable, same foot print in terms of grid squares occupied, same size of battle. Not the answer. The possibility of using small units of the smaller figures on the small downstairs grid (ie the 2012 Plan B before receiving a generous donation of painted figures more than doubling my armies) crossed my mind but that would only use a quarter of the existing armies without touching the ones still in the cupboard awaiting refurbishment. So I turned my mind to ground scale and last year's Picket's Charge game. Here there was promise, if I were to skip the grid and go with brigades at a 1 stand=300 men ratio, I could easily find myself able to fight all of Gettysburg on a 5x10 table in my garage in a few years or any number of corps sized actions upstairs. There is something worth doing separately but not much room for those Guardsmen. Then I looked at the village posts on Norman's Junkyard Planet blog and a little later at the latest post on the Stronghold Rebuilt. Aha! I had thought of using my 20mm Boers on the little table but it didn't seem roomy enough for the veldt, and I have been trying to figure a way to squeeze in some European style towns and villages into an Atlantica setting, as well as a way to rescue my version of a card table game. There it is in a nutshell! I have some Guardsmen and all sorts of excess painted and unpainted 1/72nd plastic figures and know where to get more if needed plus matching metals. Each army only needs around 50-60 figures to build all the units to handle any CS Grant Teaser including the occasional unit of engineers etc.. It just needs a new fictional background. Suddenly I am left with plans for fewer than 12 collections, including both major and minor, all under way and with built in scope for handling any butterflies that may alight without upsetting any apple carts. Lovely! In the meantime, Crysler's Farm has been fought once again but that's another post. We are not always aware of just how much subconscious baggage we carry with us, even when it comes to a hobby. When I was preparing for this playtest, I was thinking about purely practical matters, how to squeeze the most 40 mm figures into each unit so that I could use existing armies on the grid with the rule being tested. It came as a surprise, a pleasant one once I got over the shock, when I had a nostalgic, emotional response to the look and feel of the game as well as a sudden rush of ideas and urges to do things like fight some historical battles. An artist's inaccurate portrayal of the initial clash. 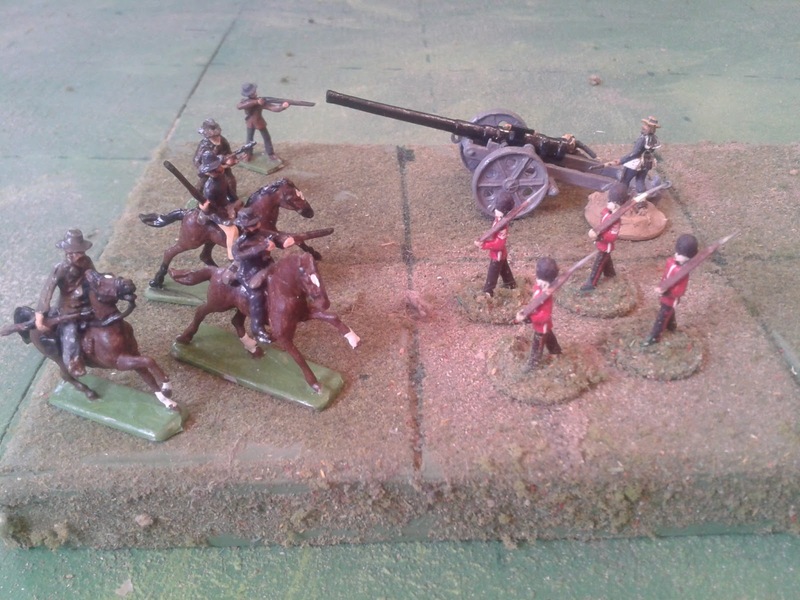 The Volunteer Rifles were soon driven back by the Victoria Rifles and Royals. The immediate effect of that was a couple of turns of impromptu rule experimentation, changes to orders, moving the rally roll, trying offensive and defensive shooting during each player turn, etc but the end result was very much a feeling of 'coming home' satisfaction mixed with excitement about campaigns and figures to come this spring and summer. I spent the next day fixing up the rules and then realized that I hadn't ended up anywhere near where I was aiming but had resolved one of my primary outstanding issues. 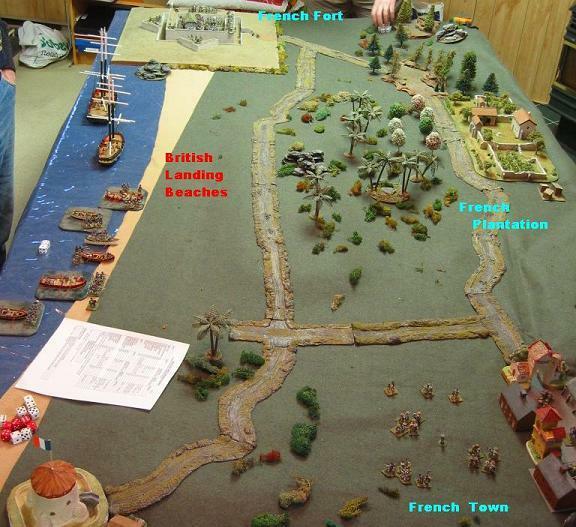 What I had was no longer a simple, 1 hour boardgame useful to kill time or introduce a new person to wargaming. Instead, I had a revised Hearts of Tin. That called for some pondering but eventually I decided, so be it. Oddly enough The Square Brigadier originally started out, not as my equivalent to Bob Cordery's Portable Wargame but merely as a pen name for a rough draft of a grid friendly version of HofT. This leaves me once again without a small introductory or casual game, so that will something to fix down the road but the question is resolved, it will be a sort of self contained 'game in a box'. With Blue's flank guard driven in, and their bridge guard being attacked from 2 directions and about to be driven back in turn, the battlelines begin to form across the center of the table. So what does the revised Hearts of Tin look like and why is it one vs the other? While it is still a simple game that glosses over low level tactics, it is once again trying to work something along the lines of how things work without the gamy (sic) bits. So, no shuffling dice, no card decks to manage, no random retreats. The goal is to primarily pretend to be a General issuing missions to subordinates and watching to see how they do and whether to reinforce success or intervene to stave off defeat. Obviously if playing solo there is a little bit of also being the subordinates doing what they can to accomplish their missions. Written game orders would be nice but I know I won't bother when playing solo so I didn't bother pretending. Everything has been considered in that light, what will I be happy dealing with day in, day out. I couldn't figure out what the handing out of dice by the general actually represented so I went back to the simplest form of orders dice, rolling for each commander leaving each to do his best to carry out his mission with the General prodding him a bit where needed by lending extra orders, best done if close at hand. This made it easy to bring back +1/-1 modifiers for commanders judged better or worse than average. Low order dice and a confused situation lead to a lull as both sides reform their lines and bring up cavalry and artillery while trading skirmish and artillery fire . Combat is still inspired by Morchauser's division into either 3 inch "melee" or longer "shooting". I see "shooting" as representing long range and skirmish fire which will only cause at best a slow trickle of casualties with a minimum of disruption while "combat" includes close range firefights as well as charges with cold steel and which will often be quickly resolved and can destroy units and take ground. Stands of troops (or groups of single figures) are once again reflective of numbers, about 150 infantry on average though this can be adjusted up and down and the ground scale with it but I have overcome prejudice and not worried too much about the size and shape of bases, treating a formation of deployed infantry the same whether it is 2 bases wide and 2 deep, with a single line of figures on each base, or 4 bases side by side with figures based 2 deep. I didn't waste pixels trying to lay it all out, as long as everyone agrees, a deployed unit is a deployed unit. 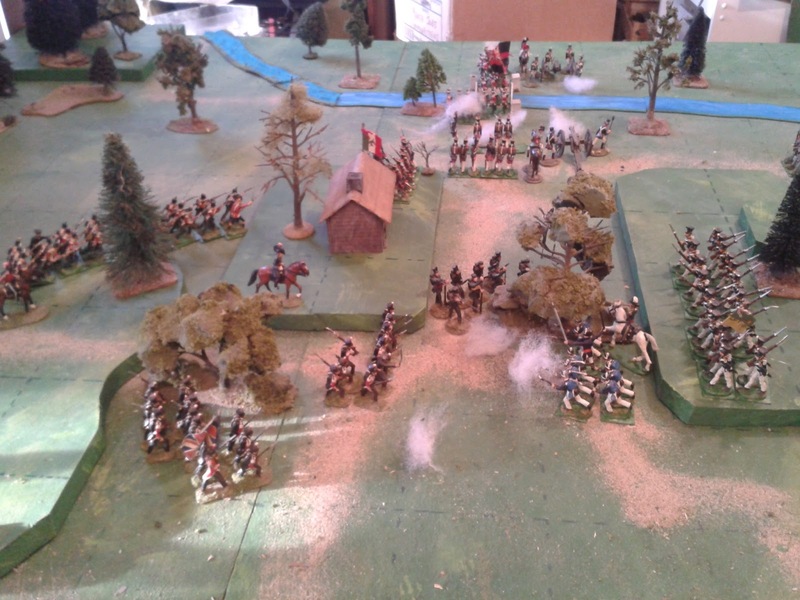 The San Carlos grenadiers resist stoutly as Red's attack stalls. A prolonged firefight ensues. One of my key goals over the last decade is to have a set of rules that allows me to fight small historical battles in real time. That means two separate things. The game should last roughly the same amount of time as the original battle and troops should be able to cover the ground they did historically while resolving clashes with historically plausible results in roughly the right amount of time. It is this focus on time that drives my elimination of as much complication and process as possible. I was pleased to note that this battle which was of roughly similar size numbers wise to some 1812 battles took place on a similarly sized battle field and appeared to be happening in about the right amount of time though the latter was only an impression since I didn't track the time, played in several sessions over several days and spent time thinking about mechanics as well as playing. The game also fit perfectly into my miniature painting/collecting plans. 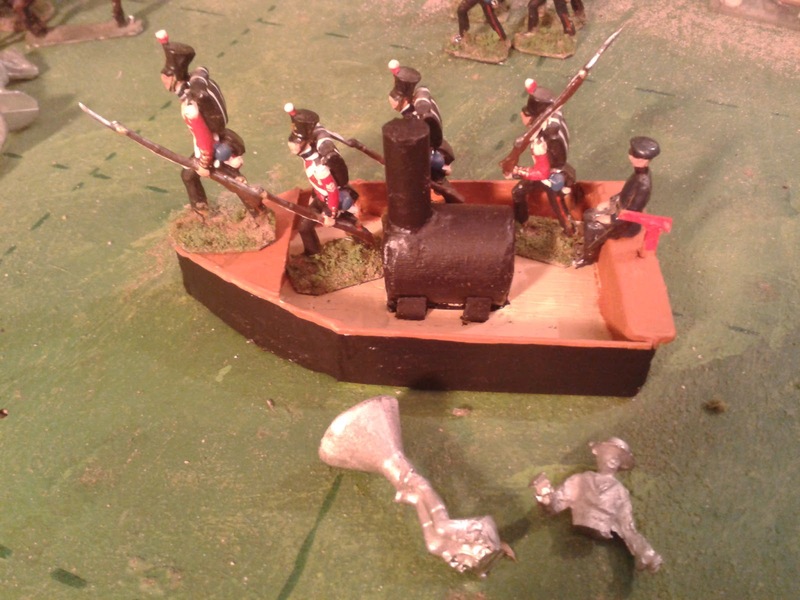 At the scale envisaged with figures representing somewhere between 20 and 40 men, 1812 battles will fit on the table and I enough figures to fill the OB though not all of the right units in a style I like to allow the larger battles to be fought without borrowing. 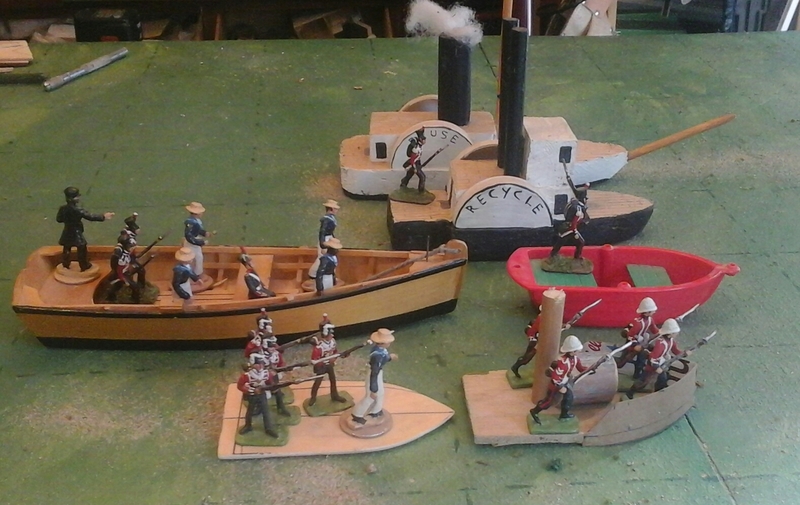 This means I get to paint a hundred or so miniatures plus guns, boats, limbers etc and a few more Commanders but don't need much more and that I am well placed for fictional Atlantica games.The Sash & Saber 1812 figures can now be sold anytime and the AWI figures as soon as the game at Huzzah is played. Having backed off from tying the game to a grid I'll have to decide if I want to persevere with gridded terrain upstairs or to do some red/white measuring sticks and leave the grid for the game in a box. I'll also need to decide whether or not to indulge in a separate set of 1860's 40mm toy soldiers just for the pleasure of painting them or if I should limit those to colonial skirmish games. At any rate, the rules, while still missing some of the less common elements like the handful of VSF elements etc which need to be imported from the old HofT and needing 7 or 8 more proof readings, are ready for public perusal again. The result can be found at right or by following this link: Hearts of Tin Rules. Heavy casualties, including a wounded Brigadier Zinn, weaken Blue's line but Red is also taking heavy casualties, preventing a decisive win. The odds shift inexorably in Red's favour though and General Scott is forced to order a retreat while he still has an army. At last! A Red victory. On to Oberhilse! Next game either a test refight of Crysler's Farm or a 1/72nd ACW battle. or maybe another Gathering Of Hosts game in between. For at least a decade I've tried to avoid tying rules to a specific organization or basing system but it sure does make it harder to write clear, short, simple, effective rules. That said, while some forms are merely easier to work with, some forms are a direct result of, or a trigger for, functional decisions. Its just better if that sort of relationship is intentional rather than accidental. The Queen's troops have driven in the Oberhilse flank guard and have now engaged the first units of reinforcements. On Sunday I decided that I should really spend a big chunk of my free time doing some tidying around the house. I'm not sure exactly which part of my brain equated tidying house with moving roughly 150 figures from chunky washers onto temporary cardboard bases. Never the less its done and, despite my long standing prejudice against single rank bases, it looks like its part of the answer to some of my questions. This format was chosen specifically to both fit in the grid and work with the current Square Brigadier rules. Once done though, all sorts of things started to pop into my head, like formations, and varying numbers of troops, things not so easily done with a 1 stand unit or even 4 individuals. A change in form triggered a review of function. I already knew something was up because I was having a hard time getting an idea for a game either upstairs or down, even the old favorite teasers didn't tease. So, rather than blindly starting to play around with rules, I sat down to see what was behind the urges and blockages. My conclusion was that the base rules were too bland to hold my interest in a small or medium game and a big game required too much work to put together frequently and there is no guarantee that size itself would provide adequate complexity. It is possible that planned period specific rules would help but the old quip about lipstick on a pig comes to mind. But there's more, the abstract nature of some of the mechanisms while providing reasonable results don't provide sufficient explanation of why things might have happened which is important both for narrative and to present choices to players that more closely relate to real ones. Now, part of the solution is as much about theater as history but if it entertains me I'll take it. After backing down from a knee jerk reaction to ditch both rules and grid, I started scribbling down refinements of various experiments from both the Square Brigadier and Hearts of Tin. It'll take a while to go from hand scribbled notes to an updated rule set, explanations will add perhaps 25%. Briefly, there will be a return to linking number of stands to the number of troops with morale being separate. Shooting will be confirmed as essentially skirmish and artillery fire with limited effects in the short run. Close range combat will be more deadly with a possibility of forcing a retreat or destroying a unit very quickly. To stop units from disintegrating too easily on a regular basis, the rally is now a sort of end of turn saving throw, still based on unit quality. As reinforcements pour onto the table, the Royal Veterans has finally cleared the barricades from the bridge. There will be fiddling of sequence of play to return to older systems and a change to the orders system. The only problem with the current system is that it suits some army sizes better than others. The revision was actually prompted by something Fitz Badger, if I'm not mistaken, did as a variation on an activation system Bob Cordery was experimenting with, or something like that, crossed with something Chris Hughes did in an ACW game at Fall in 2012. My variation is to have the army commander rolls d6 equal to the number of Brigadiers plus the number of higher Generals who can see the enemy. 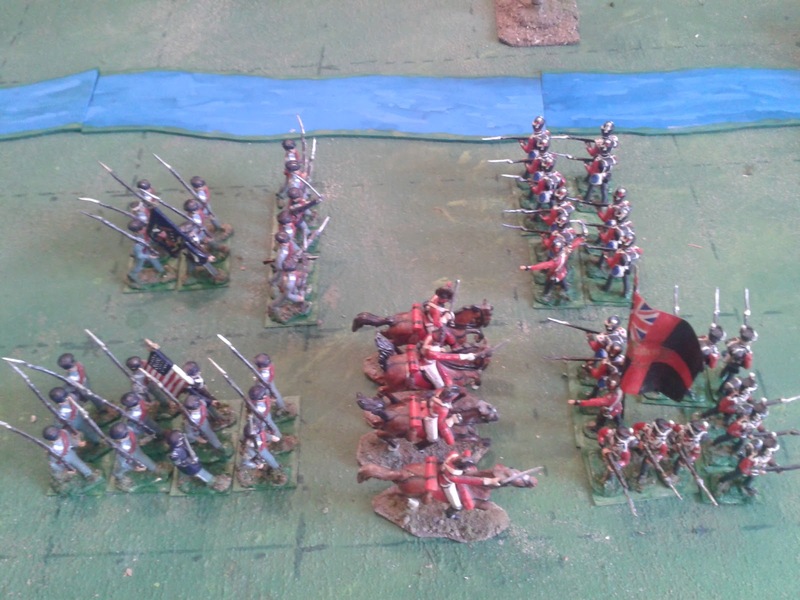 The army commander then assigns 1 or more dice to various brigadiers and/or detached units. The number on the dice is the number of units that can move or shoot. A brigadier may only use his orders on his own units and then only if they are in range. A unit can only use 1 order and any excess cannot be transferred so if the die is higher than the number of units, the excess are lost. If an army has a sound organization and is well in hand, even an average set of rolls should suffice but already during the 5 turns played the armies have gotten into trouble due to a shortage of orders in a confused situation. The game will resume tomorrow if all goes well. What's making that dust cloud? I'm in the middle of a week and a bit of standing double duty watches while my wife is off to a dog show. Makes it hard to find time for hobby stuff, especially with my room overrun by non hobby flotsom from some minor renos that we re-started as spring approached. However, there comes a time when a junkie needs his fix and its been over a week since I slipped away for an afternoon of wearing and tacking across Ron's table, forcing his 2 ships to strike while he sank 2 of my 3. Fleeing civilians herald the approach of enemy forces. The carts are a minor modifications of one of those plastic wagons from a Dollar Store cowboy set. I cut it in half, filled in the missing wall/seat, replaced 2 large wheels with PA home cast cannon wheels and added shafts for a single draft animal, a toy oxen for one, a Zinnbrigade draft horse for the other. This would of course have been an ideal time to clear the wagons and figures from my downstairs painting desk and set up some portable games but my mind had been on trying a bigger game on my newly gridded table upstairs. Sir! The enemy is upon us! 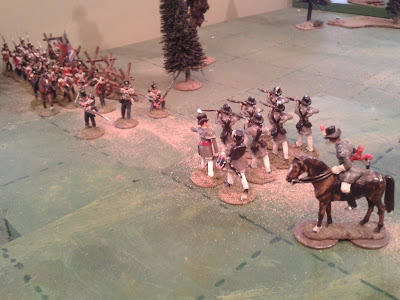 I have been trying to plan for my "battle" games to be fought using my 1/72 ACW armies but I can't seem to shake the vision of them being fought with 40mm glossy toy soldiers. Maybe not a Gettysburg or Waterloo But at least a Lundy's Lane. The question is, will the grid make this possible or will I have to find a way to stage a bigger table from time to time rather than saving that for a once a year mega game? For the 1880's breechloading rifle period I fielded 4 man "company" units assumed to fight extended. For the 1812 and 1837 smoothbore period, the one this game is set in, I intend to field close order battalions as units but it'll take more than 4 figures to convince me. On their native bases I can fit 12 Scruby figures in a 2 deep line into one of the squares but on washers I can only squeeze 8 which I don't think is enough. The exact number doesn't matter ruleswise, only visually, but it would be convenient to not need rosters or a good memory. On the other hand once I get over 100 figures I'll want either multi figure stands or magnetized movement trays for all. An overview of the table. Big windows at the end of the table don't really help with lighting for pictures especially in the afternoon but having one end up against a wall does make for more walking room. I haven't worked out all the details yet, I'll probably work those out tomorrow and retire upstairs for a couple of gaming sessions during Monday's Nor'Easter snow storm. However I have a battlefield and a General Idea. The Red Queen's and Blue Republic's troops have been facing each other across what is known in Faraway as Treacle Creek for a few days. Blue has blocked the bridge known in Oberhilse as Molasses Crossing and both sides have dug field works behind every ford, daring the other side to attack. 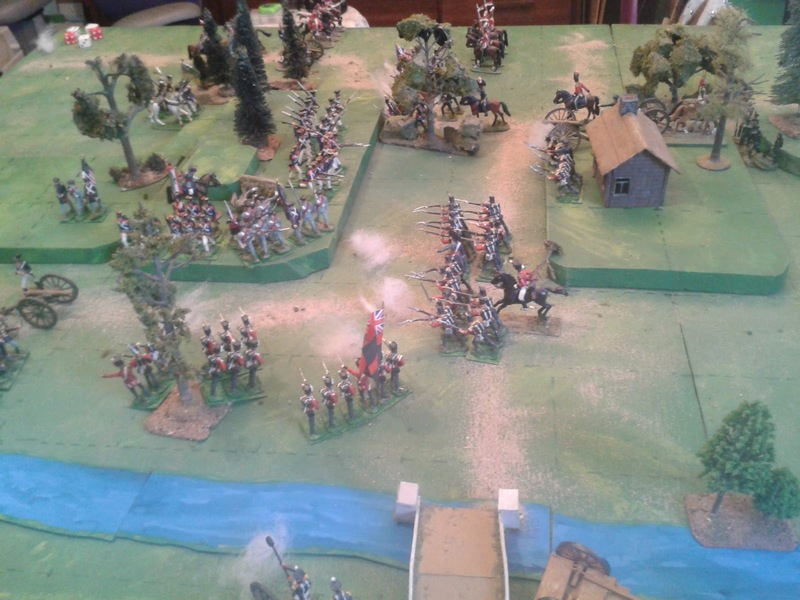 At last General Turner, under pressure from the Queen to attack, had resolved on a night march to an unguarded crossing and a dawn flank attack. We pick up the game as the Red army encounters Blue's flank guard. The plan was to finish the boats and to that end I cast up a Zinnbrigade seated limber rider and grabbed a spare sailor to promote to cox'n. However, the bit where I stitch him up is going to have to wait. With their bases cut down, 8 infantry can squeeze into the bosr. The deadline to submit my game for Huzzah is rapidly approaching and I have been getting increasingly aware that I've been dragging my feet on registering my game. I just haven't been sure why. Eventually I decided the problem wasn't really the scenario, it was me. It just didn't feel "different" enough to please me. Despite my efforts to dress it up, hidden defenders, delayed deployment for the flanking columns, personal objectives, guiding victoty conditions etc, its just a dressed up version of line 'em up and go get 'em. I decided to go back to a variation on an old favorite, the CS Grant Wagon Train scenario which always provides a fun game, especially in a convention setting since players are essentially on their own in a confused situation but with clear objectives to be taken or protected. Since I had an overwhelming urge to call the game "Drums Along the Mohawk" I am adapting the scenario to involve several groups of settlers fleeing to the safety of Fort MacDuff while parties of Loyalists and Indians emerge from the woods to try to cut them off. Now, I just need to put together a presentable wagon train out of the bits and bobs I cobble together for home use. 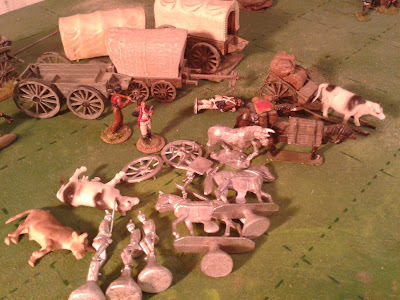 I'll slip a game of something in there somewhere this weekend but fixing up the wagon train is now top priority. I would particularly like more 2 wheeled carts. Prince August limbers are my starting point there. How long to whip this lot into shape? Thank you to all who commented on the boats and made suggestions. Upon reflection I decided that the new little steam launch was starting to look too big especially in comparison with the larger boats. I figured that one way to make the Reuse look like a larger vessel was to make her look taller. 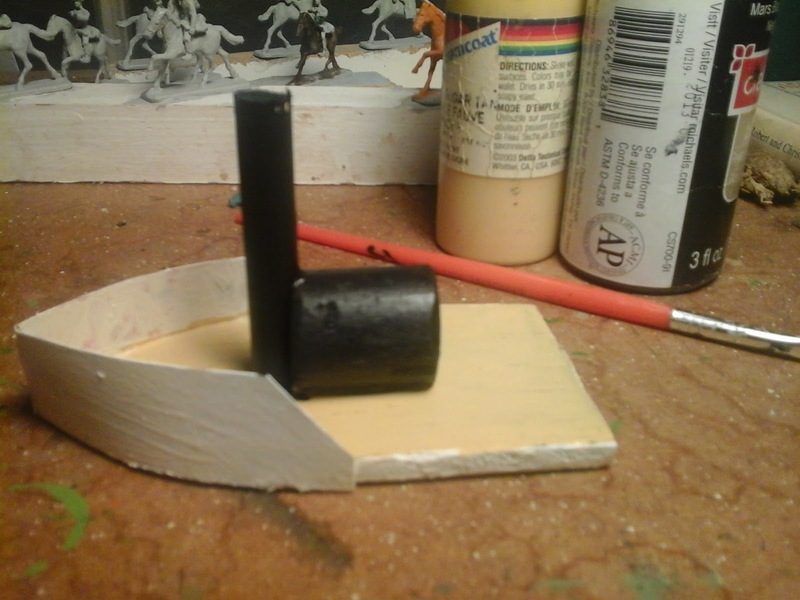 To do this I added a bulwark around the bow gun and a railing around the boat deck. Its a little low and only 1 rail instead of 2 but I think it helps. The bulwark should really be wood with gunports but there's not much room and it would be tricky to match the curve of the bow so its going to look more like steel plate. After reading a bit about early paddle gunboats and looking at pictures I decided I need to build a sliding pivot gun mount for the 32 pounder bow gun. Still working on that part. To make the launch look smaller I started by cutting down the bow a little and adding a small focsle. Then I moved the funnel from ahead of the boiler to on top of it to make it look smaller and to make more room. Then I added a bench in the stern with a tiller. Looking at the picture, I think I'll extend the gunwale to the stern. Next week I'll cast some of the zinnbrigade seated aryillerymen and convert one to a coxswain and maybe a couple to marines. I think I could probably use maybe one more steam launch and two boats to be towed or rowed. These latter will have a bow and stern like the steam launch but with low gunwales and no boiler. I never quite understood why we had to count "steamboats" when I was compelled to play touch football, "football" also has 2 syllables and so takes the same amount of time to count but would have made more sense. However, the list of things I don't understand is pretty much endless so I'll move on to talk about my boat building industry. The Reuse and the Recycle began as identical sister ships but now both have been refitted in their own way and are ready for hard service. 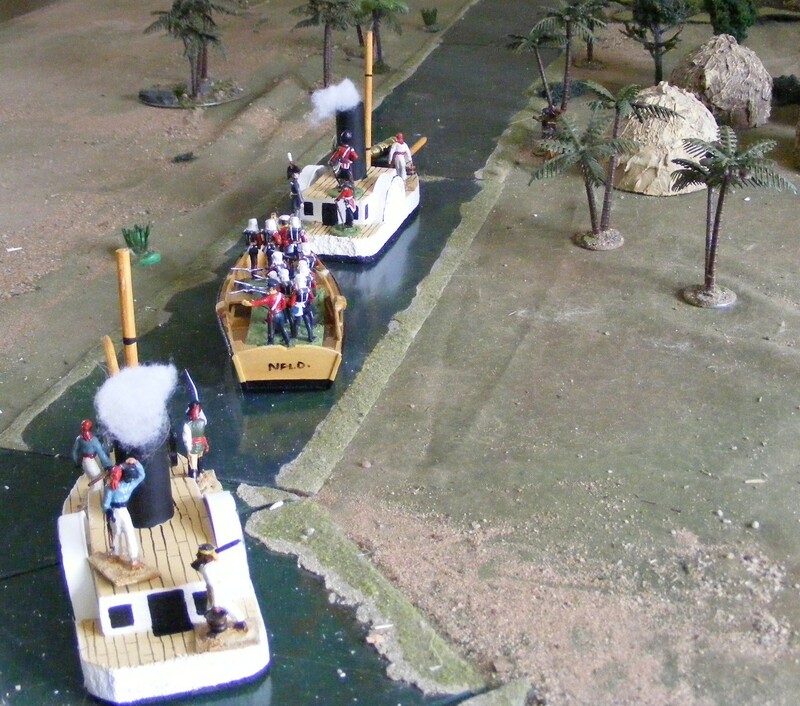 Back in the days when the Royal Navy would land my 15mm top hatted British troops on various West Indies beaches, they used nice Battle Honors boats with seated infantry, rowers and the whole bit. 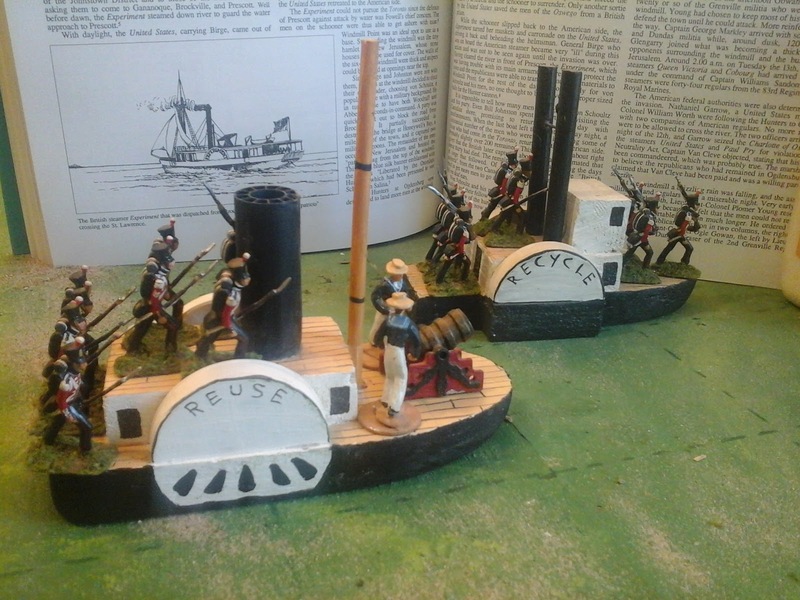 Lovely little scale models that fit on the table despite being long musket range from bow to stern. 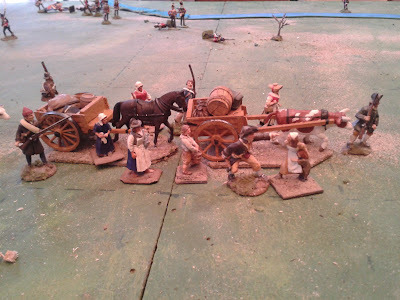 When I went from 15mm to 54mm as my primary scale without becoming a 1:1 "skirmish" gamer the disconnect between model scale and gaming ground scale became a major obstacle made worse by my reluctance to abandon the WYSIWG, moving diorama approach to wargames. My 15mm boats came out of retirement one last time about 10 years ago to appear on Gary's table. Dropping back down to 40mm had little impact on the problem but my fairly recent conversion to a more abstract toy soldier and growing appreciation of a symbolic approach crossed with a toy esthetic has helped. Take the boats in the first picture, the proportions are internally inconsistent and wrong. They are obviously too small for the figures but their foot print is still too big for the ground scale. Despite these faults they have been used in games again and again and worked well. Because of the esthetics the eye overlooks the inconsistencies while the footprint works within the structure of the rules. When I decided I wanted some smaller boats to ferry troops up or across rivers, I hit an extreme case of the old conundrum. What I wanted was a longboat, something akin to the souvenir fishing dory in the 2nd row above but with the foot print of the red toy boat. Since my two steamboats are meant to be larger vessels with cabins and some freeboard, they should be taller than a longboat which is obviously not the case with my existing boats. My first thought was to just do a thin wooden hull with a mast. Oars would probably be better but they look odd with standing oarsmen who then join the landing party and permenently sitting ones just take up too much room. This low hull has a reasonable height differential with the decks of the steamers but in practice the figures look like they are on a raft, not in a long boat. First row prototypes, 2nd boat commandeered boats, 3rd Recycle, 4th Reuse before her make over. The issue of course is that without a deck, the figures on the boat should actually be sunk down into the table, obviously a problem. A mental review of OS boat pictures reminded me that this is usually done by adding unnaturally tall gunwales out of cardboard. Fine, I started to fiddle with some cardboard and then realized the bit of wood I had used for the hull was so thin that gluing card gunwales to it in a robust fashion exceeded my skill. I made a 2nd hull from a slightly thicker board, an offcut from my last trimming of my gaming table as it happens. I started on the gunwales again and again I stopped. The figures looked just as silly with knee high gunwales but deeper ones on such a small boat just looked too bizare. To distract myself I started experimenting with masts and crew capacity while pondering movement rules for wind and current where the river is only 1 square wide. Since small steamboats were used by both sides of the War of 1812 to move troops on inland waterways I decided that my life would be easier if Atlantica was precocious and made wide use of steamboats. Two pieces of dowelling soon provided a boiler and funnel and work on troop capacity and gunnels continued. Tugboats and fishing trawlers both came to mind as I fiddled with bits of cardboard. They often have a higher bow and a low stern with low or no gunwales. 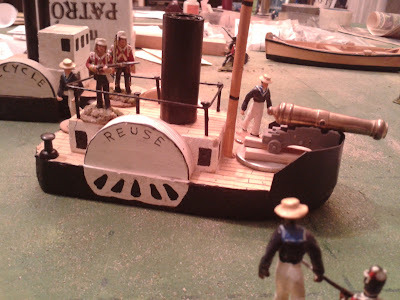 The high cardboard gunwale on the bow would suggest structure while the low quarterdeck would allow troop bases to overhang and help keep that low, smaller vessel feel compared to the big armed steamers. The use of a screw for propulsion is a bit anachronistic for the 1812 and 1837 campaigns but dashed convenient. I want to add a few small details but essential she's ready to assist the bigger boats on an expedition. Together they can carry 5 companies of infantry plus a company of blue jackets and a naval rocket battery. Is that enough or should I make one more? Almost there, just a few details to add either physically or with paint. Cutting a very basic gunwale stretched my cardboard modelling techniques, I don't think I'll be making tanks or artillery anytime soon! 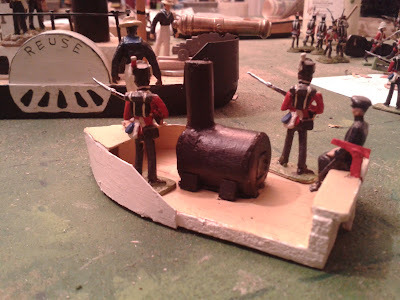 Jack and John both lend a hand to build a new river steamer to carry troops upriver. Surrounded by endless forests, ts hard not to feel they are being watched but they can never quite see any hostiles. Some minor renovations and rearranging have overflowed into my games room once again. Since there is little room or time for a game I decided to resume working on props and figures that had put off doing until I figured out what the heck I wanted to do. The last game was a small example of the sort of Middle Game which I intend to be the main stay of the Atlantica campaigns. For the foreseeable future Big Games will be restricted to the 1/72nd ACW and planning has begun for a game based on one of the early Western or more precisely, Trans-Mississippi theater. Wilson's Creek, Elkhorn Tavern and Prairie Grove are all being looked at. That leaves the Little Game, the Colonial, skirmishy, sort of game. There are various options but the one I have had my eye on is a return to the rain forest of the North East. We first glimpsed the cannibal tribesmen in 2009 and first saw them in action during the 2011 Nest of Pirates game. I'm still not sure if these games will play ok with the rules as is or if I'll have to make some small changes to make games interesting with small numbers of units but the only way to tell for sure is to try. Now that the grid and size of grid, time periods, etc have been determined work can resume. Even if I allow for some allies, either Atlantican tribesmen or Brethren of the Coast, or both, I need more tribesmen. I also need more boats than can fit the grid. The refitted HMS Recycle overhangs one square but I can work with her. The HMS Reuse takes up 3 squares and is just a bit too big. 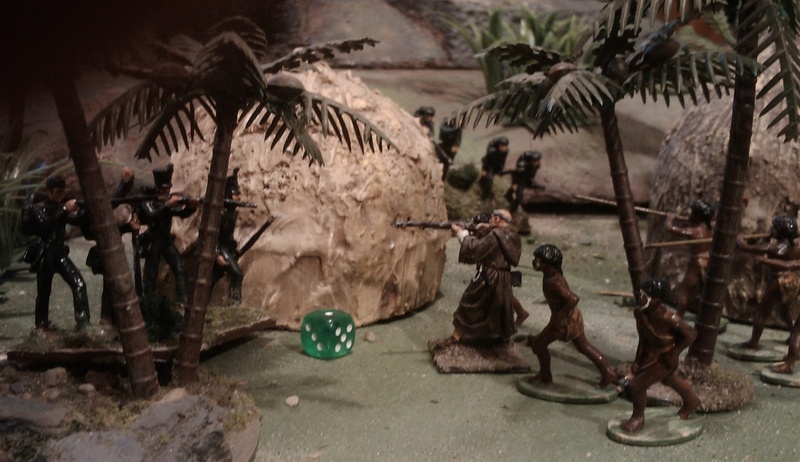 During an expedition against a nest of Pirates, the Victoria Rifles find the allied forest tribesmen to be formidable foes. I can do this! (more or less, in a ham fisted, improvised, Floor Games sort of way). In 2010 came this speculative illustration of a coming game. Its still coming but its getting closer! Last week's game at my Gathering of Hosts blog. Its not often that I go a week between posts but last week my hobby time was spent largely on my medieval/fantasy campaign, something I expect to occupy a big chunk of my time this year. Not that my expectations seem to have much to do with what actually happens. I'm also contemplating a larger role for my home cast 18th C NQSYW collection in light of the new range of SYW figures from Prince August. Then there is the Atlantica toy soldier collection to work on. The idea being to have smallish 'armies' at 25 year intervals, (1812/1837/1862/1887/1912) all in the same style so that figures can be borrowed from adjacent intervals and the whole will be able to draw from 1 collection of terrain and accessories but which will allow me to paint a wider variety of uniform styles. I also have an itch to get a largish (for me) 1/72 ACW game sorted out and on the table, something to balance the usual quick games. Not to mention about 500 25mm ancient and 40mm AWI and 1812 figures to organize and sell. Lots to do over the next months.